My problem is that I spend sooo long brainstorming about what twist I can put on whatever ingredient is in the limelight that, before I know it, the opportunity has been and gone. So this little number was, in fact, supposed to be a Halloween pumpkin post but luckily for me I can still try to get away with it as a Thanksgiving recipe and it can sit alongside the pumpkin pies currently flooding the blogosphere. 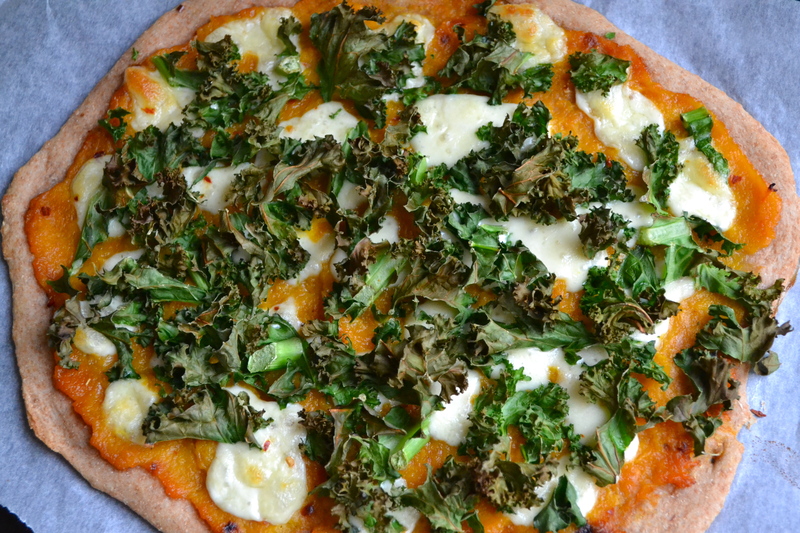 So Happy Thanksgiving to those lovely people over the pond – and this year I’m just thankful I can still post my pumpkin pizza. Recipe for pizza base is from Honestly Healthy. Preheat your oven to 190°. Mix the pumpkin and garlic with a lug of oil and spread out evenly over a baking tray lined with greaseproof paper. Roast until soft, roughly mash with a fork and set aside to cool. Meanwhile, add the yeast and water to a small bowl, cover and leave to stand in a warm room for 15min. Next whisk the yeast and water together and leave for another five minutes. Mix the flour and salt together in a large bowl and make a well in the centre. Pour the yeast/water mixture into the well and stir until a dough starts to come together. Turn out onto a floured surface and knead until you have a smooth dough – approx. 5-10min. Split the dough into four balls and roll each out to create the pizza base. I find the easiest way to do this is to roll the dough straight onto some baking paper, then simply slide the paper onto a baking tray. This way you can get your pizza dough as thin as you want without worrying about having to transport it to a baking tray afterwards. 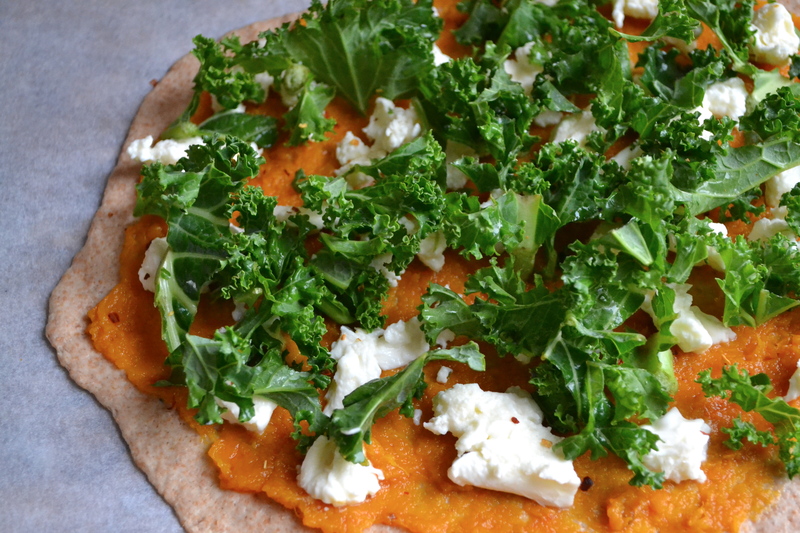 Smear a tablespoon or two of the mashed pumpkin onto the pizza base, scatter with some torn mozzarella and then a handful of kale. As usual, I like to finish the recipe with a sprinkling of chilli flakes. Pop in the oven for 15-20min until the base is cooked through and crispy.